Busser or busboy job description etc. In our today’s tutorial, you will learn everything you should know about food runner of a restaurant, their job description, list of duties and responsibilities, salary, tips, job requirement etc. 6 How Do Food Runners Get Paid? A food runner is another integral piece of the inner workings of a restaurant. 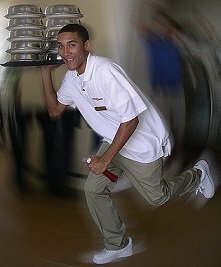 Some restaurants have food runners on every shift, some restaurants have food runners on only specific high volume shifts, and some restaurants do not hire a food runner at all, as the duties of a food runner are perceived to be the collective responsibility of every member of the wait staff, including waiters and waitresses, busser or busboy, and restaurant managers. Either way, food runners still continue to be a part of many restaurant experiences, especially in restaurants that do a high volume of business, or that are larger in size, and necessitate more assistance than generally smaller or slower paced restaurants. Food running is another job within the restaurant industry that isn’t exactly viewed as glamorous, but food running is a great entry level restaurant position, that can certainly lead to further positions inside the restaurant, like waiting tables, once you have got your foot in the door, know the staff, and most of the menu items. Hot food! Getting it to the tables is priority number one for a food runner. All in all, the job isn’t a terrifically difficult one (though it does help to know how to carry multiple, sometimes up to four, plates of food at one time) and your work hours are usually fairly short, while still allowing you to get paid a minimum restaurant wage, and also getting tipped out in cash at the end of the night by the wait staff. The job description of a food runner is quite simple; almost intelligible just by its name. The job of a food runner is to pick up food from the kitchen, and deliver it to the correct table in the restaurant, to the correct diner who ordered the food (preferably without needing to ask who ordered what). 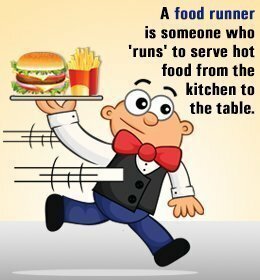 The purpose of a food runner is to alleviate some of the pressure off of the waiter or waitress who is serving that table, and to ensure customer satisfaction by assuring that the food gets to the table hot and as soon as possible, without sitting in the heating window and overcooking or getting cold. Speedily and efficiently deliver food from the kitchen to tables in the restaurant. Know the order the food was placed in, so as to deliver each dish to its respective patron. Fill water glasses and/or pass on beverage refill orders to servers at table. General waiter and waitress assistance, including table bussing, check dropping, etc. How much do food runners get paid? Well, as we have said before, and will continue to say in the future, compensation for many positions within the restaurant, depend tremendously on the type of restaurant you might be working in. Again, bigger restaurants with higher price points will deliver bigger tips to servers, and bigger tips to bussers and food runners. The opposite is also generally true for smaller restaurants with lower price points. That said, food runners can expect to be paid roughly their minimum wage salary, along with about $10 or so dollars more an hour cash tips from the wait staff. Again, this dollar amount can change drastically from place to place, anywhere from 5 to 25 dollars an hour more or less. Food runner usually make $10 to $15 per hour in USA and around £7.47 on average in United Kingdom. Average salary of a food runner in USA is around $19,200 per year and in UK, food runners make around £18,150 per year. This is mostly for entry level positions. Experienced food runners earn lot more than these figures. How Do Food Runners Get Paid? 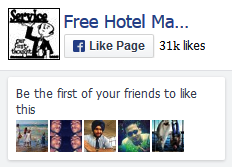 Food runners are tipped out, just as many other positions are tipped out within a restaurant. At the end of a shift, food runners are tipped out by the wait staff. Depending on the night, servers might leave tips in an envelope to accommodate for all of their tips from the evening, with a food runners name on it to be picked up and another shift. Food runners will also generally get a bi-weekly wages check as well. Education: While this isn’t an imperative part of the job, its best to have a diploma or your GED in order to be a food runner. A basic level of education proves a lot for a prospective employer, and this could be the difference between whether or not you get the job. Restaurant Experience: Again, if you don’t have it, still go for the job, but to be a food runner, it is important to employers that you understand customer service at a basic level, as well as some of the pacing and necessities of the restaurant industry. If not, no worries, this can be an entry level position that will get you the experience you need as well. Cleanliness: Its important to remember that if you are the food runner in the restaurant, you are the last face a customer will see before they eat their dinner. Its important to have good hygiene (clean fingernails, hair in place, etc.) to represent yourself and the restaurant as well as possible. Strength: As strange as it might seem, its definitely true. Restaurant plates can be heavy duty, and with food on them, can weigh up to a couple pounds each. Now put six or so of those on a platter, or carry them around with your arms outstretched, and youve got some sore arms at the end of the night. Prepare for that by making sure your body can handle the stress of lifting and carrying for a whole night. Teamwork: The better you can interact, communicate, and assist your fellow employees the better off you will be. People often think they are out for themselves in the industry, but the more amicable you can be, and the easier you get along with your coworkers, the faster you will get things done as a group, and the mo:re apt you will be as a restaurant crew to make more tips, and that way everyone benefits. Get those things in line, and you should be all good to go hopping into the restaurant industry and getting hot food to patron tables. Be ready for a fast paced environment, and be excited to have lots of quick communication that remains professional and friendly with coworkers, customers and managers alike. Remember, once you’ve ran food for long enough, proved your ability to know the menus and the staff, interact well with customers, and built up a reputation with your superiors, running food is a great way to get promoted to a waiter or waitress position within a restaurant, which can really lead to far better tips, and a much better income all around. Previous articleSide Work: A Waiters or Waitresses Worst Enemy?